Angry Birds, from Rovio, and Candy Crush, from King, are two of the most iconic games to hit mobile computing platforms in recent times. Rovio's financial reports and King's IPO prospectus have some interesting data points showing two different approaches to deal with the economics of free-to-play gaming. First, the chart above shows Rovio's revenue by business segment. While growth has stopped, consumer products (including Merchandising and licensing) make up roughly half of Rovio's revenue. The other half is generated by the Games segment which includes in-game advertising and the sale of virtual goods. In contrast, King generates practically all of its revenue from the sale of virtual goods (advertising generated ~10% of revenue in previous years, but has since been phased out). 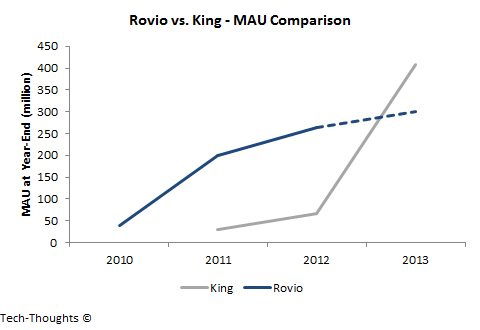 The chart above shows that Monthly Active Users (MAUs) for King's and Rovio's games are comparable. King's user base exploded in 2013 as Candy Crush became a viral hit on Android and iOS. 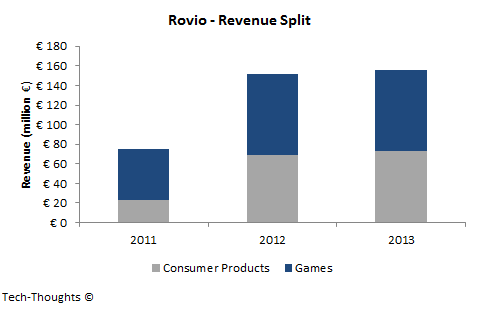 In comparison, Rovio saw most of its growth in 2011. Rovio did not reveal MAU data for 2013, so I've assumed a figure of 300 million (modest growth from 263 million in 2012). We can use these data points to come up with a rough estimate of each publisher's ARPU. The difference between the two revenue models is stark. 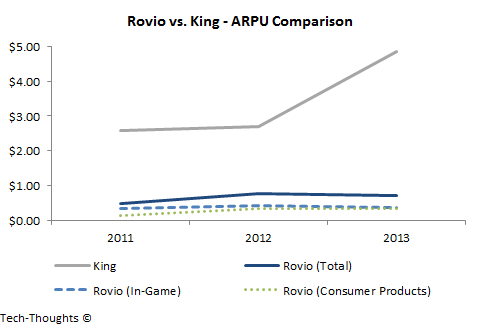 Even if we consider 2013 to be an outlier because of Candy Crush's sudden popularity, King's average ARPU is roughly 5-10 times higher than Rovio's in-game ARPU. It seems that King's games were designed with in-game commerce in mind, while Rovio's games were designed for a paid download and advertising-supported revenue model. As in-app purchases began to supplant the paid download model, Rovio introduced in-game commerce without changing game design or mechanics. This led to comparatively lower transaction volume and lower revenue. Of course, Rovio has some advantages over King as well. Because of their revenue model, Rovio has had to increase focus on off-store initiatives. This led Rovio into the entertainment business -- specifically animated TV content and even an upcoming feature film. In effect, their revenue model has put Angry Birds in position to become an entertainment franchise and could lead to more sustainable cash flow streams.